While teaching Middle School the trend especially for the girls were to make jewelry for their friends instead of making card or buy them. So with that in mind this blog will give some ideas for making such projects. Cut a strip of foam that will fit loosely around the wrist. You also can use decorative edge scissors to give the bracelets some extra pizzazz but they are not required. Cut a length of ribbon that is three times the length of the foam strip (roughly) and glue to the foam. Make sure that the side you want facing out is glued facing down onto the strip. Flip the foam over and get your craft on! 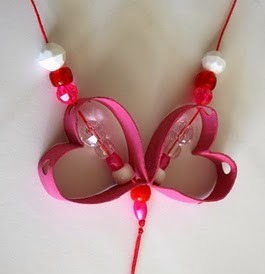 This can be as simple as adding foam stickers, gluing on beads, using glitter glue. Use the ribbon to tie the bracelet on. You can make them loose enough that they can slip on and off. You can use plain, thin ribbon and with sharpie write a statement on the bow of the ribbon. 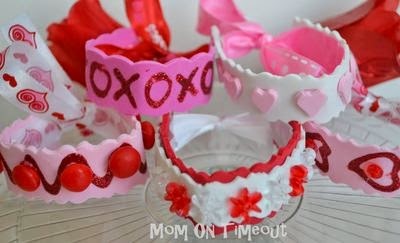 Materials: a toilet roll tube, scissors and a hole punch to make the hearts. Start by squashing the loo roll flat, then cutting it in cm wide sections; and then reverse one of the creases on itself and bend it a bit to make the heart shape. Hole punch the roll where the string will be going to be threaded through. See above picture! Paint to coat the hearts in. Hint: cover a baking tray with a sheet of tin foil because it will keep the mess to the tray. Dry, after drying you might need to reshape them a bit; and, one can start threading them with beads. If you put a couple of strategic snips in the cardboard hearts then you can make them interlock in different ways.